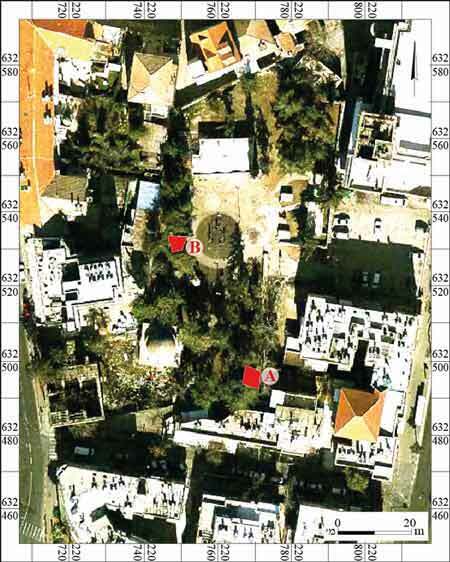 In October 2016, a salvage excavation was conducted in the Nebi ‘Akasha compound on Strauss Street in Jerusalem (Permit No. A-7830; map ref. 220736/632422; Fig. 1), prior to the construction of a public garden. The excavation, undertaken on behalf of the Israel Antiquities Authority and financed by the Eden Company for the Development of the Center of Jerusalem, was directed by T. Lieberman (field photography), with the assistance of N. Nehama (administration), H. Makhlin (antiquities inspection), D. Tanami (metal detection), V. Essman and Y. Shmidov (surveying), Y. Gorin-Rosen (glass), C. Amit (studio photography) and E. Belashov (drafting). According to Islamic tradition, the prophet ʽAkasa bin Moḥsin, one of the disciples of the Prophet Muḥammad, is buried in the mosque compound. Approximately 200 m south of the mosque is the al-Qameriya türbe (mausoleum), named after Hassam ed-Din al-Qameri, in which there are three tombs. According to one tradition, members of the Qameriya family who fell in battle against the Crusaders in 1251–1266 are buried in this structure. The mosque and mausoleum structures date to the Mamluk and Ottoman periods (Kloner 2001, Site 318). Conservation and restoration work was carried out in the al-Qameriya türbe on behalf of the Department of Antiquities (from 1990 the Israel Antiquities Authority), at which time the building’s walls and dome were reinforced (HA 1963). 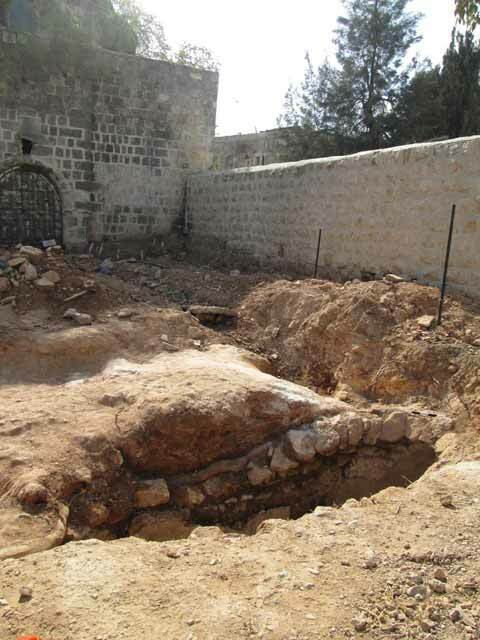 An archaeological excavation conducted next to the opening of the al-Qameriya tomb (De‘adle 2009) facilitated the dating of the construction of the türbe to the sixth decade of the thirteenth century CE and the nearby gravestone, to the fourteenth century CE. In the early twentieth century, a plaque bearing the name of a deceased individual, probably belonging to another grave, was affixed next to the gravestone; afterward, the area was covered with soil and refuse. 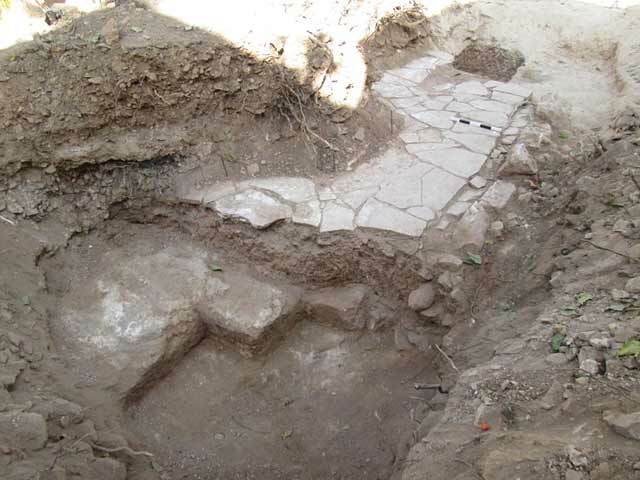 A building that included drainage channels and a cistern dating to the nineteenth century CE was exposed c. 30 m south of the excavation (Landes-Nagar 2012). Two areas (Fig. 2) were opened where ancient remains were identified during an antiquities inspection. 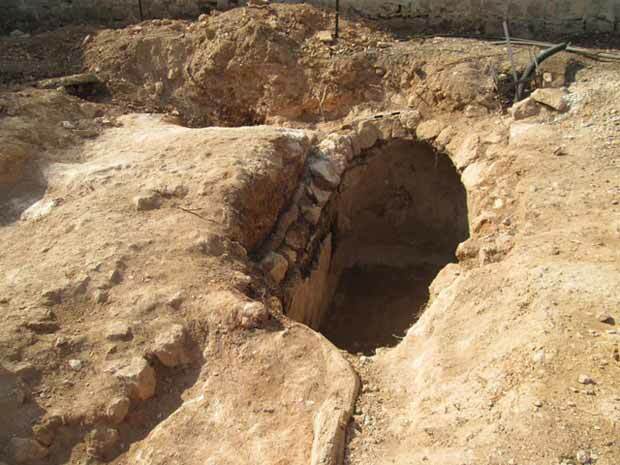 A stone floor and a quarry beneath it were exposed in Area A, east of the al-Qameriya tomb, and a water cistern was revealed in Area B, north of the al-Qameriya tomb. Based on the ceramic and glass finds recovered in the excavation the stone pavement dates to the Ottoman period. Area A (Fig. 3). 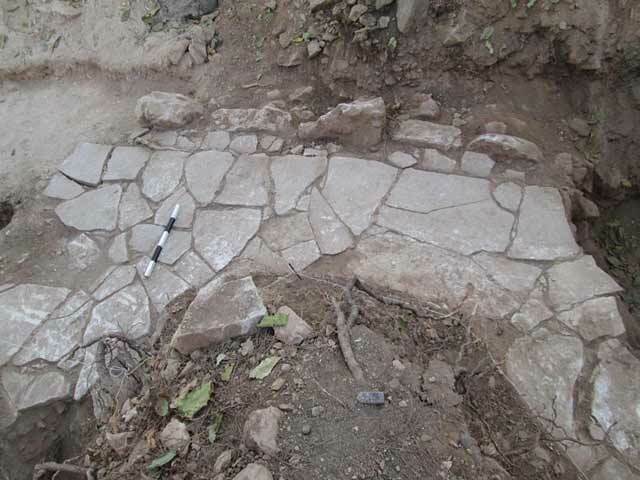 A stone floor (L2; 1.6 × 3.2 m, thickness 0.2 m) built of flat asymmetric flagstones (average size 0.5 × 0.6 m) was exposed. The flagstones were set in place on top of gray-white mortar mixed with charcoal and a few pottery sherds. The northern and southern parts of the floor were severed in the area and were not preserved. Based on a trial trench dug during the inspection work it seems that the floor continued at least another 2 m to the west. 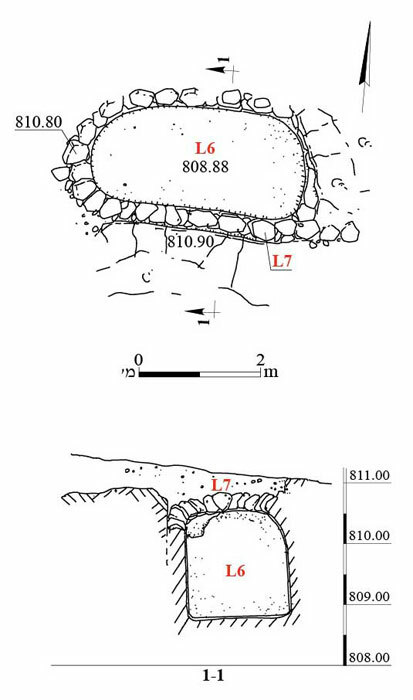 A row of smaller fieldstones (L3; average size c. 0.2 × 0.2 m) was found in the eastern part of the floor, and slightly to its east was another row of fieldstones (W4; height c. 0.45 m, average size 0.5 × 0.5 m; Fig. 4) that delineated the eastern limits of the stone pavement. An accumulation of soil (depth 0.9 m) was excavated below the floor and Gaza Ware body fragments dating to the Ottoman period (eighteenth–nineteenth centuries CE; Israel 2006) were found. 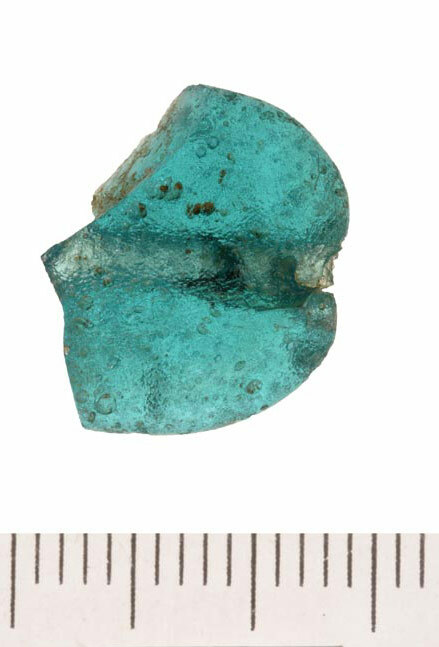 A fragment of a blue-green oval glass bead that likewise dates to the Ottoman period was also discovered (Fig. 5). 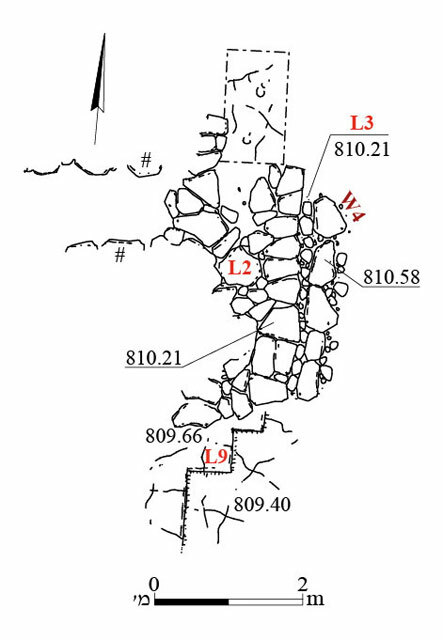 Rock-cuttings (L9) were revealed in the southern part of the area beneath the accumulated soil. Four quarrying steps and severance channels were identified, indicating a quarry for building stones (Fig. 6). The finds discovered below the stone pavement dated its construction to the Ottoman period at the earliest. The stone quarry, which was exposed beneath the floor, predated it. Area B. An elliptical water cistern (L6; 1.8 × 2.0 × 4.0 m; Figs. 7–9) was found, lined with a layer of white plaster to which an additional layer of plaster or gray mortar was applied. The cistern was covered with a partially preserved vault that survived to a maximum height of two courses (L7). No datable material was found in the cistern, but it contained voussoirs from the vault that had collapsed inward (Fig. 10). The mortar on the sides of the cistern was similar to the mortar exposed in a cistern previously excavated c. 50 m south of the area (Landes-Nagar 2012) that was dated to the nineteenth century, part of a building complex that included drainage channels. It seems that the water cistern was used at the same time as the stone floor in Area A. All the finds from the excavation date to the Ottoman period. They were apparently related to the activity that transpired in and around the Nebi ‘Akasha compound at that time. De‘adle T. 2009. Jerusalem, Nebi ‘Akasha. HA-ESI 121. HA. 1963. 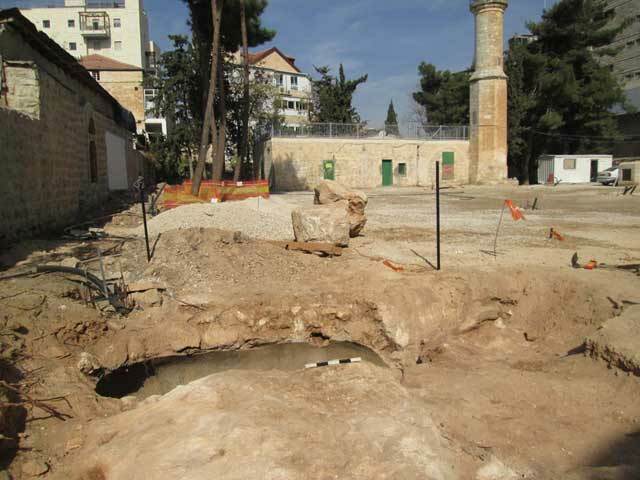 Conservation Works in Jerusalem: The Qameriya. HA 6:17 (Hebrew). Israel Y. 2006. Black Gaza Ware from the Ottoman Period. Ph.D. diss. Ben-Gurion University of the Negev. Be‘er Sheva’ (Hebrew). Kloner A. 2001. 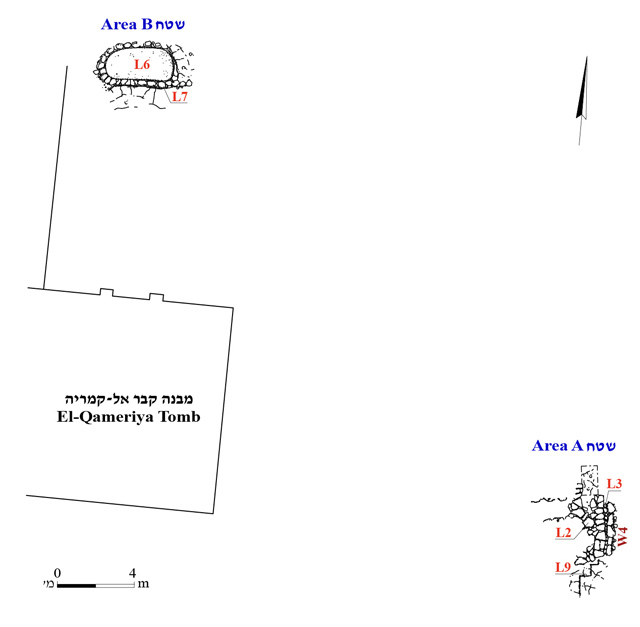 Survey of Jerusalem—The Northeastern Sector (Archaeological Survey of Israel). Jerusalem. Landes-Nagar A. 2012. Jerusalem, Hanevi’im Street. HA-ESI 124. 4. The stone floor, looking east. 6. The stone floor and the quarry beneath it, looking northwest. 7. Area B, plan and section. 8. The water cistern against the background of the al-Qameriya tomb, looking south. 9. The water cistern against the background of the Nabi ʽAkhasa mosque, looking north. 10. The water cistern, looking west.